Want to learn how to make your own website that can start earning you money online? This post will show you how to do it in under 5 minutes. In a recent post, I talked in detail about creating multiple streams of income to develop financial redundancy and how it is an often overlooked part of prepping. And while there are many ways you can earn extra income and develop financial redundancy, I feel the internet is hands down the best option. Nothing compares to the internet’s low cost of entry, speed, and ability to set up multiple streams of income that bring in money even while you are sleeping. I’m definitely no online money-making guru but what I have learned and continue to apply has helped me consistently make over $1000/month in extra income — with some months over $3000. This is all from purely online sources (this site as well as other sites). The best part about it is the income comes in without any direct involvement on my part — meaning I don’t have to “man” a store or process orders. It’s all done through automatic systems. In other words the money comes in regardless of whether I’m awake, at my regular job, asleep, or on vacation with my family. But can I make a website too? Yes you can.. Most people know for the most part if you want to make money online then you’ need to have some type of website and in most cases that is true. The problem is many people think it is a difficult or expensive thing. This couldn’t be further from the truth. The fact is, setting up a website that can make you money is not only easy to do but it’s very affordable (around $6 month). In this post you’ll learn step by step the process of finding a web host, registering your own domain name (internet address), installing your own site, choosing a design, and writing your first piece of content — all of which can be done in under 5 minutes. When it comes to choosing a webhosting service the one I highly recommend (for reasons you will see later on) is Bluehost. In the past I used to use GoDaddy (the hosting service this site runs on) which is a good service but for a beginner setting up a first-time blog/site it can be a bit complicated. 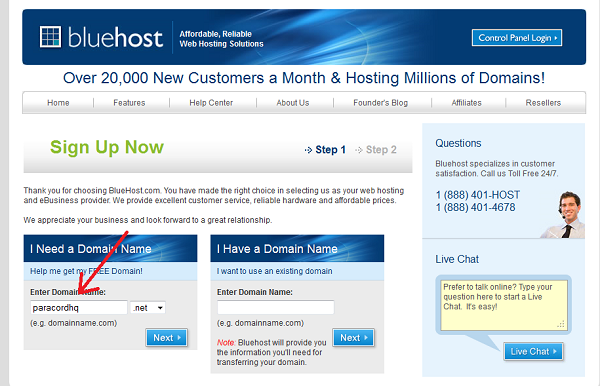 But for ease and speed of setup, and what I now use and recommend, Bluehost is the clear winner. 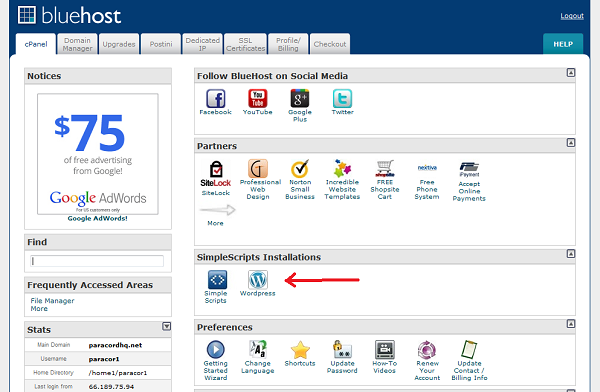 For the rest of the instructions, I’ll be demonstrating the setups using the Bluehost service. 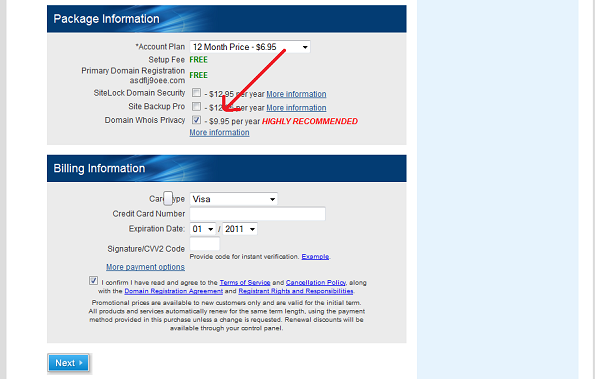 Disclaimer: I do earn a commission if you purchase a hosting plan through my Bluehost link. You are free to choose any company you wish but if you do end up purchasing through my affiliate link thank you so much for your support! 1. 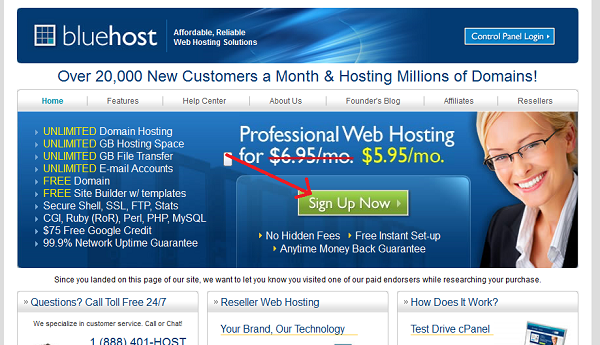 Navigate to bluehost and click on the Sign Up Now button. 3. 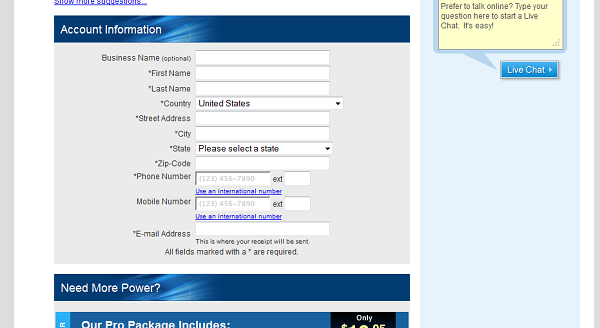 If the site name is not taken than you’ll be prompted to put in your personal information. 4. In this picture it’s best to deselect the SiteLock and Site Backup options, but you probably want to ensure that domain privacy is selected (see arrow). Domain privacy basically shields any personal information (name, home address etc) from users doing a reverse “WHOIS” lookup on your site name. At this point you now have a domain name but no website content to associate that name with. 1. After you’ve paid by credit card, click on the CPanel link to get to the main administration panel. 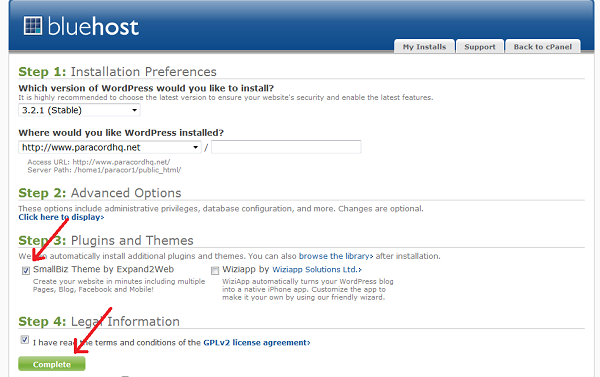 In here, click on the WordPress installation button. 3. Choose your installation preferences ensuring that the Smallbiz option is selected and click on the “Complete” button. 4. On the next screen be sure to make note of your user name and password. 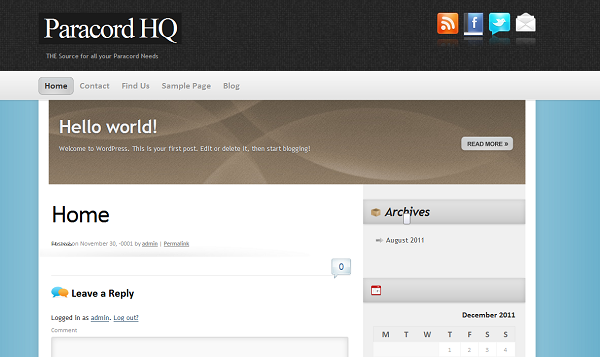 This will be what you will use to login to your site (to create content, make updates etc). 1. 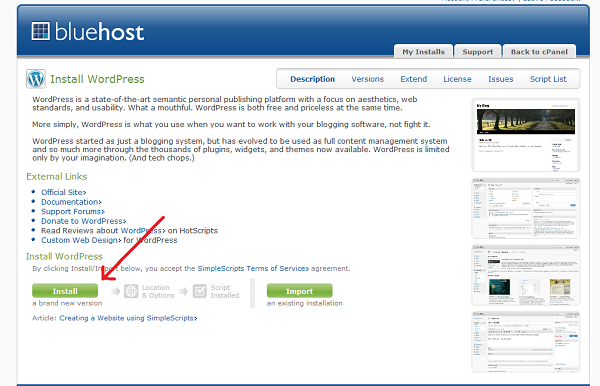 Log into WordPress using the username and password that you took note of in a previous step. 2. After logging in, click on the “Appearence” link. This controls the look and feel of your website. 3. 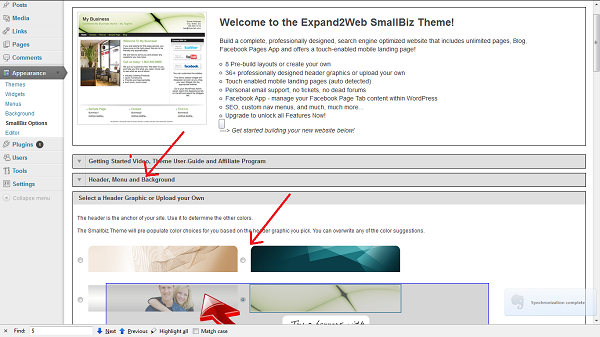 If you selected the SmallBiz option during the initial installation like I told you to, you should see the option to activate the SmallBiz theme. 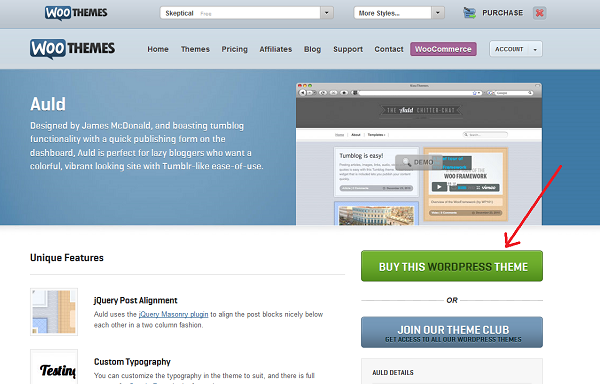 This theme is great since it can be used as a small/personal business website or a blog if that’s your desire. 4. 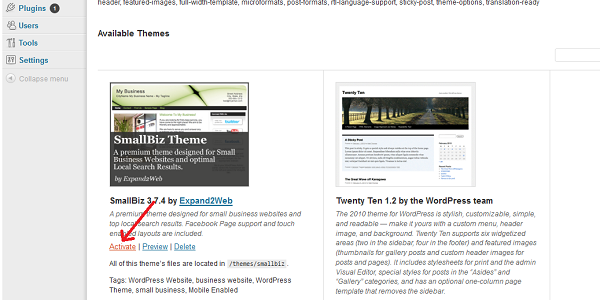 Once you’ve activated this theme, your site now becomes the default look and feel of the SmallBiz theme. In this screen you can make some changes to that theme if you desire (the free version allows you only limited changes). 5. 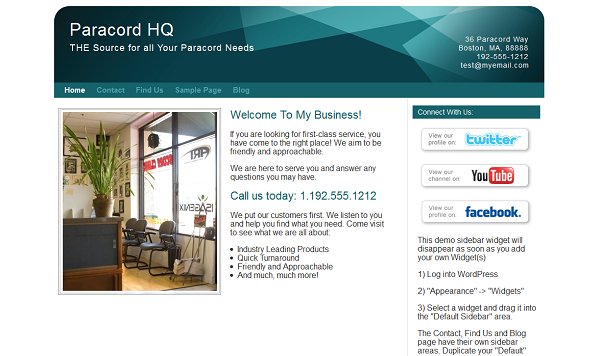 Now, if you go to your webpage (in this case it’s http://www.paracordhq.net) in a browser, you should see your newly associated theme. 6. 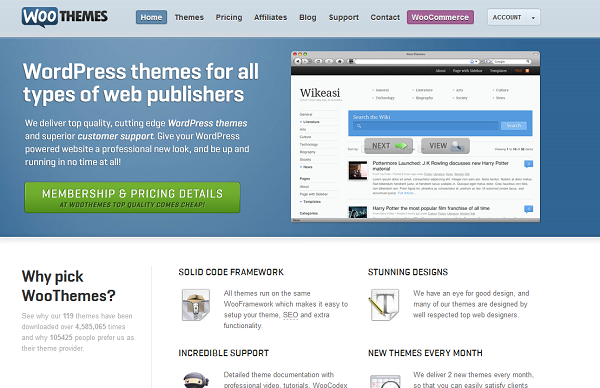 If you don’t like the look of that theme, you can do a search for many other free themes out there. 7. Once you’ve found a theme you like, click on the install button and just like before, simply click on the Activate link to activate it. 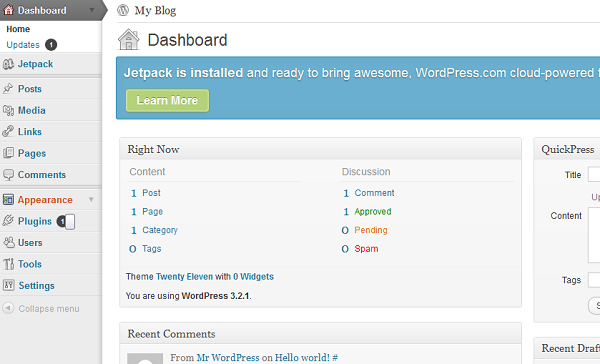 Now if you go to your site in a web browser you’ll see your new theme. 8. If you’re looking for a more professional look to your site you can pick up some really beautiful wordpress themes for under $100 at Woo Themes. This is very cheap in comparison to having a designer/developer do a custom one for you. 9. 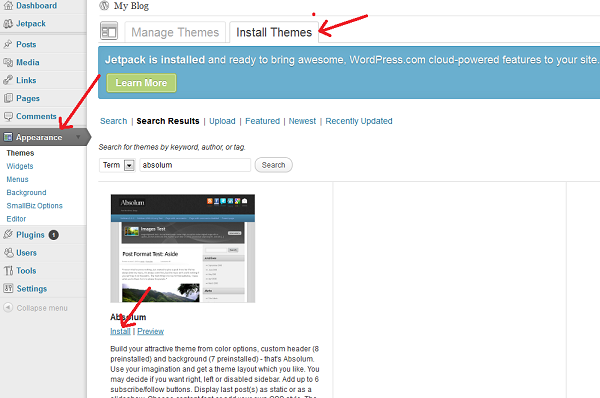 You would just purchase a theme, download it to your computer and then upload it in the themes section in your WordPress Adminstration area. 1. 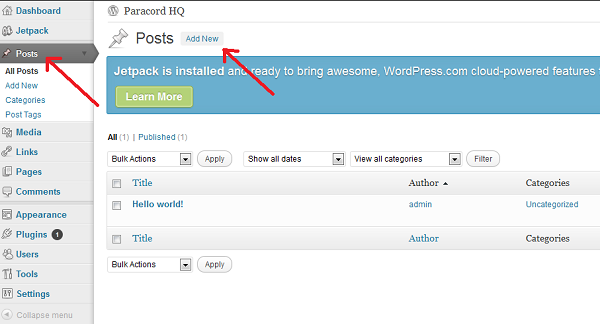 Navigate to the “Posts” link and click on the “Add New” button. 2. Put in a title, add some content and when you feel it’s all good, click the “Publish” button. 3. Now when you navigate to your website, you should see your new content! Wasn’t that easy? 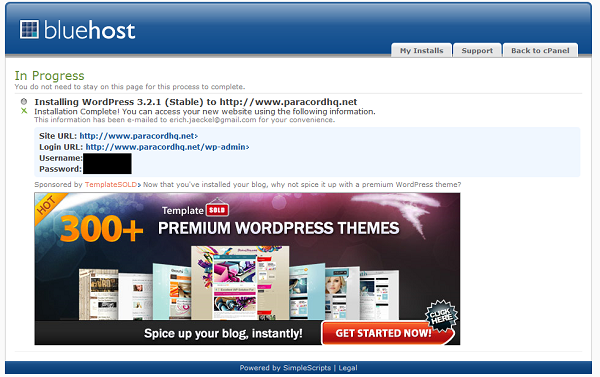 By following the previous steps you should be able to get a new site up and running in under 5 minutes. If you’ve always wanted a website but never thought you could get one up an running due to the extraordinary costs or technical difficulties, there’s no excuse for you now. So what are you waiting for? Go on over to Bluehost and build yourself a website! Now that you’ve got a site, the next steps are building it up to the point where you can make some money online. Although I’d like to go into more detail here on TI on how you can do this, I don’t feel that it fits with the purpose I’ve laid out for this blog. However, I know that many of you will want to know what to do next. So for those of you who are interested, I’ve decided to create a newsletter that will go into detail (like this post did) on what I’ve done to create online income. This way you’ll still get some valuable information and I can keep it separate from my blog. You’d be surprised. Whatever you’re passionate about there’s bound to be someone else out there in the webosphere that has an equal passion. Has the first TI Financial Redundancy Newsletter gone out yet? I haven’t seen anything – maybe stuck in a spam filter somewhere? Thanks. This was the just the spark I needed to build my fire! I followed your instructions and started my own site, southernprepper.net, and I couldn’t believe how easy it was! Thank you so much Erich, your advice has been invaluable. Thanks for the kind words. Still working on getting that newsletter together (it’s a bit hard right now with the time) but please send me any other questions you may have and I’ll do my best to answer them. the highest quality websites on the net. I’m going to recommend this website!